BBC Two - Trust Me, I'm a Doctor, Series 3, Episode 2 - How can I spot the symptoms of Lyme Disease? Lyme disease is a bacterial infection, passed onto humans by infected ticks. The ‘peak season’ is April-October, though they are active all year round. It is difficult to estimate the total number of UK cases of Lyme disease, but they are understood to have increased more than four fold in the past 10 years. The more time you spend outdoors, the greater the likelihood of being bitten. However, there are simple ways you can minimise your chance of catching Lyme. Dr Saleyha Ahsan joined climbers in the Peak District to go through the ‘red flag’ symptoms of Lyme disease that they should be aware of. The first piece of advice is to try to avoid getting bitten by a tick in the first place. There are areas known as ‘hotspots’ – often woodlands and moors - where ticks are common, but they can appear in city gardens as well. They grab on to people and animals, and find a warm, damp place to attach themselves and start to bite. They can feed for hours, swelling enormously in size. Since the bacteria that cause Lyme disease are transmitted whilst it is attached to you, finding them and removing them as quickly as possible is important. Give yourself a thorough search after you’ve been out in the countryside, and if you find a tick, stay calm and remove it quickly and properly with tweezers or ideally, a tick removal tool. You shouldn’t squash the tick, put petroleum jelly on it or burn it: doing any of these things increases the likelihood of it regurgitating its stomach contents into the bite wound – and that could include the bacteria that cause Lyme disease. 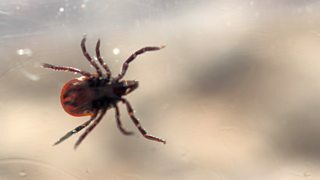 If you are unlucky enough to get Lyme disease, in around two thirds of cases, a distinctive rash called erythema migrans will develop in the days to weeks that follow the tick bite. It is often shaped like a bull’s eye, but not in all cases, and some individuals will have several rather than one. Aside from the rash, flu-like symptoms are another strong indicator of Lyme, alongside facial palsy which is especially common in children. Others may experience tingling or numbness in parts of the body, and rarely, severe headaches. The fact that these flu-like symptoms often occur in the summer months is another warning sign. If you get these symptoms AND have been bitten by a tick – or been out in a tick hotspot – then it is worth talking to your doctor. If left untreated, early localised Lyme can attack the nervous system and cause debilitating neurological problems. However, if you get prompt antibiotic treatment, it can successfully treat the disease and prevent further illness. Cases of relapse have been documented, which has necessitated further treatment. You should return to your GP if symptoms re-occur, rather than wait for them to go away.